1. How are your filters better than other filters on the market, such as Reverse Osmosis Systems? - Naturally & Gently Raise Alkaline pH by releasing trace amounts of natural minerals. - Support natural electrolytes and minerals that are naturally present in your water. 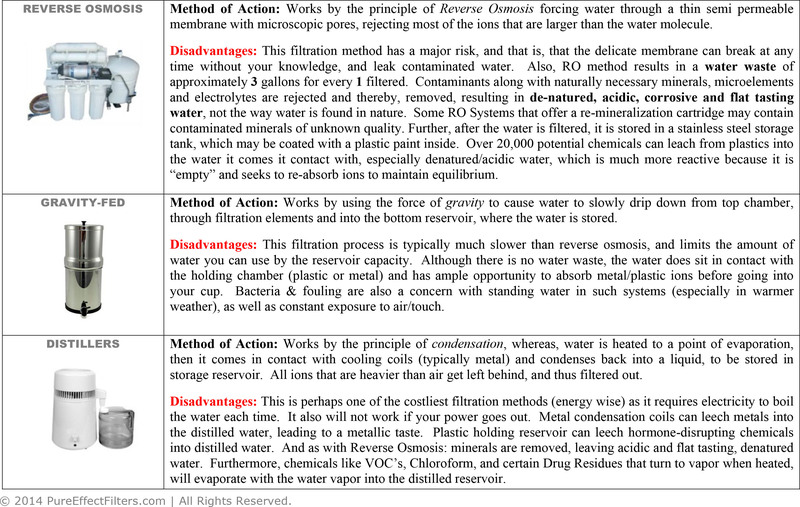 - Improve Redox (Lowers Water's Oxidation Potential). - Effectively Filter Fluoride, Chloramine & Radiation (some of the most difficult water contaminants to remove). - Do not rely on a thin film membrane which can clog, break, leak impure water and breed bacteria. - Do not waste water (R.O. systems can waste apx. 3+ gallons to filter 1). - Do not store water in a difficult to clean post-filtration storage tank (where water can become stagnant over time). - Do not require an electric booster pump, and thus can still provide clean water during power outages. - Easier to install and maintain. 2. How do your filters release and preserve minerals and electrolytes in the water, and which minerals/electrolytes are they? "Awareness of the importance of minerals and other beneficial constituents in drinking water has existed for thousands years, being mentioned in the Vedas of ancient India. In the book Rig Veda, the properties of good drinking water were described as follows: “Sheetham (cold to touch), Sushihi (clean), Sivam (should have nutritive value, requisite minerals and trace elements), Istham (transparent), Vimalam lahu Shadgunam (its acid base balance [pH balance] should be within normal limits)“ (Sadgir and Vamanrao 2003). That water may contain desirable substances has received less attention in guidelines and regulations, but an increased awareness of the biological value of water has occurred in the past several decades. Full Report. 3. Why is a TDS meter not an accurate measure of your filter's performance? A TDS Meter measures Total Dissolved Solids, which primarily includes natural and necessary minerals/electrolytes such as Sodium, Calcium, Magnesium, Potassium, Silica, etc. (without these elements, water would be acidic, corrosive, denatured, can leach minerals from the body, and is not ideal for drinking purposes). As such, our systems are intelligently designed to leave these nutrients in the water, hence, a TDS meter will always show a reading higher than 0 when using our filter, as it should. Furthermore, TDS meters only detect a positive or negative charge, which means, many neutral contaminants (pesticides, ammonia, herbicides, etc.) won't be detected, neither will it detect larger molecues that fall outside the energetic detection field; and since a TDS meter does not differentiate between natural nutrients and contaminants, and because minerals and electrolytes make up the greatest concentration of TDS, it is not an accurate or acceptable test of ideal drinking water. To properly test your water, you would need to test for specific contaminants in question. Any filter company that claims water with 0 TDS is the optimal filtration result, is in our view, not aware of, or is for some reason disregarding the ideal chemistry of drinking water. For more on this subject, please see question #2 above regarding the importance of minerals/electrolytes in water. 4. If I purchase your whole house filter system, do you still recommend having a separate filter in the kitchen, and why? Our Whole House Systems will signficantly improve the quality of your water for bathing, showering, dish and clothes washing, etc. and help create an less toxic home (helps prevent Chlorine, VOCs, Radiation and other Gasesous contaminants from going into the air of your home through the water vapor), however, since it cleans the water BEFORE it goes into your homes' plumbing system, the cleaned water can still pick up leaching contaminants from the pipes, hoses, water heater internals, etc, so it won't be the most optimal for drinking because of this. Our countertop or undercounter system in the kitchen will filter your water directly AFTER the plumbing system, and at a much slower flow rate, which results in extra redundant filtration and an even higher % of contaminant removal due to slower flow and greater contact times with the filtration media. So for drinking/cooking we recommend a kitchen unit regardless of whether you have the whole house system or not, both system compliment, but don't replace one another. 5. Why does my filtered water appear cloudy? Cloudiness can be the result of 2 harmless causes. 1. When brand new, the cartridges need to adapt for apx. 1 week; during this period the natural calcium mineral from the cartridges can cause cloudiness. 2. If the cloudiness in your cup goes away within apx. 1 minute after you pour it, it's the result of dissolved microscopic oxygen bubbles and actually help make the water even fresher. In both cases, the effects are natural, harmless and temporary. 6. How do your water filtration systems compare to the high-priced water ionizer machines? Our systems' primary focus is to clean your water of a very wide range of contaminants, something water ionizers aren't designed to do very well, since their main purpose is to ionize or alkalize your water artificially using electricity and metal plates made of what some experts consider toxic metals (titanium, platinum, etc.). Also, water ionizers have been a subject of much controversy regarding their benefits vs. risks due to the overly alkaline pH they produce using artificial means. PureEffect Systems use quite a different approach to raise alkaline pH within the drinking water range as found in nature (apx. 7.5 - 8.5). The pH increase is an effect of the natural minerals in our system, doesn't require electricity and is a gentle and natural process, similar as it occurs in nature as water flows over mineral-rich riverbeds. 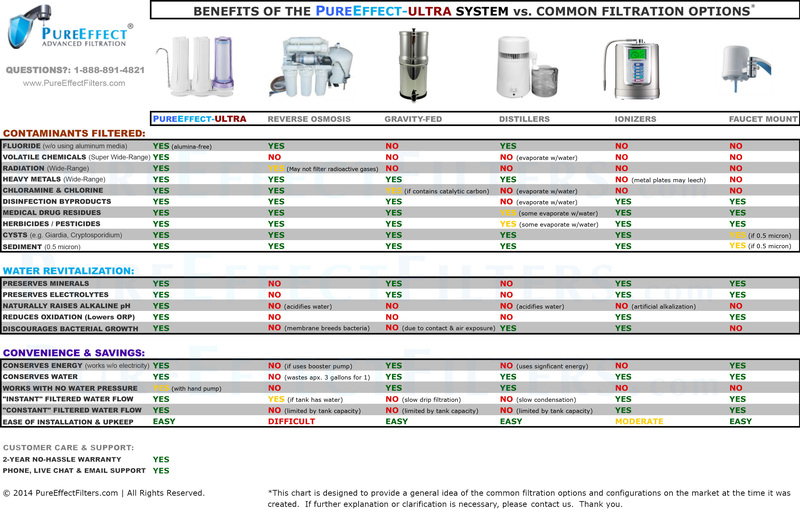 In short, PureEffect Filtration Systems filter a wide-range of contaminants, naturally and gently alkalize your water, provide significantly more benefits and performance, yet cost a fraction of the price of artificial water ionizers. 6b. What is your position on the recent hype with hydrogen-infusing water machines? As with any new technology, especially one which involves drinking water and is promoted by hype and anecdotal data (poor quality and/or biased studies, hearsay testimonies, etc.) as their main points of sale, we are being cautious about it and do not feel confident about supporting or imlementing it in our product line at this time. Our professional opinion after nearly a decade in the water industry and seeing various similar fads come and go, is that these machines will have a similar fate as the artificial water ionizers, they will fizzle out as the hype settles down and people realize that the less we mess with natural chemistry of water, the better. Until serious and credible scientific research (randomized, placebo-controlled, double-blind crossover studies) can verify it's short and long term safety and efficacy, we err on the side of caution. However, if you wish to use such a machine and want the water properly filtered before it, then you may be able to connect our system before the hydrogen machine. And please, at least verify that such machines are Not Made in China so you may avoid problematic quality and other unforseen issues. 7. How does your FluorSorb-MAXTM Fluoride Removal Technology differ from Activated Alumina often found in other filters? We DO NOT use Activated Alumina (aka Aluminum Oxide) in our filter systems because it is a synthetic oxidized form of the metal aluminum, and is a cheaper and much less effective material with potential for leeching aluminum ions back into the water, it also requires acidic water pH and impractically low flow rates to be effective. The FluorSorb-MAXTM Media is our proprietary, all natural, alumina-free Calcium/Carbon based media which interacts with the fluoride ion and attracts it to it's surface and pore structures. Side by Side Comparison testing has shown that FluorSorb-MAXTM is much more thorough and consistently removes apx. 45% more fluoride across a wider pH range and higher flow rates than Activated Alumina. FluorSorb-MAXTM removed fluoride down below detectable levels as verified by indpendent lab testing, see here. 8. How can I quickly check how much Fluoride my County adds to my drinking water? 9. What is REDOX and how do your filters increase the Antioxidant potential of water? REDOX stands for Reduction-Oxidation, which in this case means the Water's ability to “give” electrons (subatomic negative charges) to other substances it comes in contact with. These electrons are donated to “electron-hungry” free-radicals (subatomic positive charges), Free-Radicals are then reduced and neutralized. When unbound by an electron free-radicals may speed up the aging process. Our filters contain a special media which reduces water's oxidation level by approximately 25%. 10. What % of Heavy Metals, Radiation and the difficult to remove Fluoride and Chloramine can your filters remove from the water? 98% | According to the manufacturer of the patented KDF55 Media which we use. >95%* (removed down to non-detectable levels in independent testing) *Removal % is dependant on pH, Contact Time, Flow Rate and Fluoride Concentration, and is accomplished using our proprietary FluorSorb-MAXTM cartridge, which is made of activated-carbon bonded with a natural calcium substrate and superheated to nearly 600oC. It consistently outperformed the commonly used synthetic Activated Alumina media by removing apx. 50% more fluoride. *Most cities keep their fluoride levels around 0.7mg/L as per Federal Recommendations. >99% Due to our latest innovation: The SuperBlockTM Dual-Catalytic Carbon Technology, which is a proprietary combination of 2 unique catalytic carbons in 1 single 0.5 micron carbon block. >99% Uranium removal: A recent well water analysis of a NH customer showed a Uranium count of 66.4 pCi/L (more than 3x the EPA limit of 20pCi/L) . After installing our filtration system, follow up testing showed Uranium count to be less than 0.67 pCi/L, resulting in the effective removal of over 99% of this contaminant. For other radioisotopes, e.g. Cesium-137/134, etc. : Based upon the specific scientific properties of the Zeolite in our AntiRad-plus Cartridge, by knowing the atomic weight of the radioisotope, the PPM concentration in the water, and the specific cat-ion exchange capacity per gram of Zeolite, we are able to calculate that it can remove over 115ppm of Radioactive Cesium from over 1000 gallons of water. 115ppm is a high concentration. We use the same Nuclear-Grade Zeolite that Nuclear Facilities have been using for over 40 years. 11. How does the filtered water taste? 12. I see your countertop filters connect to the faucet, will I be able to continue using my faucet to wash dishes, etc. when I don't need filtered water? 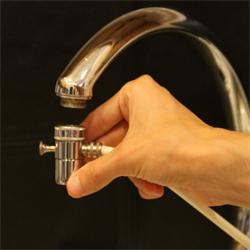 Yes, our special diverter valve which screws onto the thread of your faucet allows you to redirect the water to the filter on-demand by a flip of a handle. 13. How long do the cartridges last? For superior performance: For our 2, 3 and 4 chamber systems, we recommend to change the cartridges every 500 gallons or 12 months, whichever comes first. Our digital gallon-meter device can help you keep accurate track, click here. *As a customer, you will receive a 10% discount on replacement filter orders when subscribed to our email list (subscription confirmation is sent after you place an order). 14. Can I run Hot water through these systems? No, hot water (120+ degrees Fahrenheit) will not be adequately filtered. Please use only Cold or Cool water when operating the filters. If you happen to accidentally run hot water through the system, simply run cold water through the unit for 2 minutes to flush out the hot water. With regard to whole house systems, you will still get clean filtered hot water because the cold water line of your home will connect to the filter system, get filtered first and then will go to the hot water heater to be heated. 15. What is the best method of determining which contaminants are in my water? All tap water, unfortunately is contaminated to some extent, even the most natural waters can be contaminated with natural contaminants like hydrogen sulfide (rotten egg smell), uranium (earth leaching), iron, lead, radon, radium, etc. So no water test is the final answer, but they will give you a general idea of your water quality at that moment of testing for those particular contaminants. Some sources report that there are over 80,000 chemicals used in society today, so it would be nearly impossible to test for them all anyway, and often times if a certain contaminant is not detected during a test, it can still become present in the future, as water quality is always changing. As such, a powerful water filter is not only necessary to deal with existing and known contaminants, but also serves as insurance against potential future contaminants that can appear in the water or untested ones. Some inexpensive and basic water tests (for: chlorine, heavy metals, pH, pesticides, etc.) can be purchased on Amazon.com and done at home, for more advanced and more accurate tests (Fluoride, Chloramine, VOCs, Pesticides, Radiation, etc.) we recommend using an ISO Certified and EPA Accredited lab such as this one: Click Here. Note: Any water testing labs that also sell water filters or water filter companies that also do lab tests should be avoided in our opinion, as there is a bias, conflict of interest and thus, potential for deception. 16. My faucet has low water pressure, which of your filter systems would suit me best? Any of our systems should work fine with low water pressure as the cartridge media is designed for low water resistance. 17. Do you offer financing options? Yes, financing is available to US residents through PayPal Credit® (click here to see current promotion). Simply place your desired items in the cart and proceed to the checkout page, then select "Paypal Credit" as the Payment Option and you will be re-directed to PayPals' site for final payment processing. 18. Do you make Shower Filters? Yes, we make an advanced Shower Filter which can be seen here. 19. Do you plan to offer gravity or pump filters that can work outdoors? Yes, we're currently in the research stage and do plan to carry such filters in near future. Bear in mind though, for the larger part of our life, our drinking/cooking water typically comes form the kitchen faucet during non-emergency situations, therefore, we made countertop water filters our top priority and focus. An "emergency" filter will only compliment our countertop systems as we believe having both is ideal. To be notified of new product releases and special promotions, please enter your name and email at the "Promotions and Discounts" Section at the top of this site. 20. I'd like to sell/market your products and would like to know if you have an affiliate program? Unfortunately, our affiliate program is at capacity and we are not accepting new affiliates at this time. We plan to re-open the program in Q1-Q2 of 2019, please check back with us then. Thank you. 21. How do I properly cleanse the UF Membrane? Fully submerge the membrane into 3-5% Hydrogen Peroxide liquid (we recommend to place it in a glass vase and fill it with hydrogen peroxide), ideally every 6-12 months for a period of 12 hours (or 60 minutes if using 10-15% Hydrogen Peroxide). In 12 hours remove the membrane and rinse under warm water, then install it back into your system. Flush the system with cold water for 5 minutes before use. 22. What sort of maintenance is required on the filter units? Our systems are designed to be simple and easy to care for. With every cartridge change wipe the units inside and out with hydrogen peroxide and rinse with warm water. You may also wipe and rinse the plastic and rubber parts on the filter cartridges, but do not get any hydrogen peroxide inside the filtration cartridges. The spout may be cleansed as well by pouring hydrogen peroxide through it and using a cotton swab to wipe inside, then flushing with warm water. Please ask us using our live chat feature or visit the contact us page. THANK YOU FOR YOUR INTEREST! > See our Filter Models Here.